"This is a very good all round ENT book " Reviewed by: Harry Brown on behalf of www.glycosmedia.com, November 2015 Apply the latest knowledge and techniques with content thoroughly updated by leaders in the field. 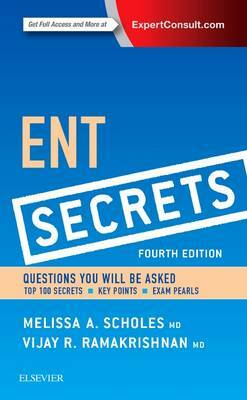 Quickly review key concepts through a question-and-answer format, bulleted lists, mnemonics, "Exam Pearls," "Key Points" summaries, and practical tips from the authors. Enhance your reference power with a full range of well-organized essential topics in ear, nose and throat disorders. Improve content knowledge with a special chapter containing "Top 100 Secrets," providing an overview of essential material for last-minute study or self-assessment. Expert Consult eBook version included with purchase. This enhanced eBook experience allows you to search all of the text, figures, and references from the book on a variety of devices. "This is a very good all round ENT book which is an ideal and detailed text for the undergraduate but I am sure primary care staff and ENT specialists would also be interested in this most useful addition to the ENT literature."